Street Art in Brooklyn. Photo: The Weekly Standard. 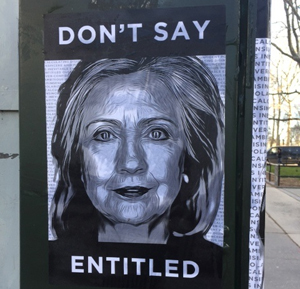 Just when many have come to believe both coasts are comprised only of frothing idiotic Leftists, uncredited conservative art with a message has emerged In the Brooklyn area of New York near Hillary Clinton’s new campaign headquarters. 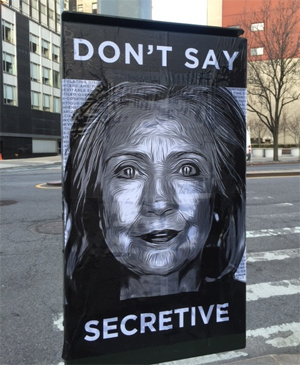 The Weekly Standard’s Daniel Halper reports that “a source sends along these photos” in a Sunday post “of anti-Hillary Clinton signs everywhere.” Clinton announced her presidential campaign Sunday afternoon. 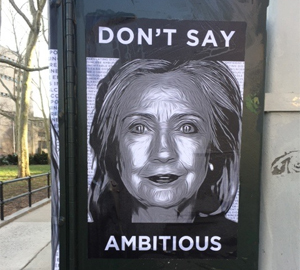 It is not known who posted or funded the Brooklyn street art. Click here for the original post by Halper on the Weekly Standard. This follows a cutting edge trend of artists with attitude contrary to the Leftists establishment taking to the streets with powerful messages. Click here for a story on the LA street artist Sabo from the Hollywood Reporter. In the 70s the establishment was Conservative and free-thinkers were Liberal. As the Democrat Party and media cronies have increasingly moved to extreme if not dictatorial positions and most certainly imperial, the classic “Liberal” (those who believe in individual Liberty) are all Conservative or Libertarian. This entry was posted in Tulsa Speaks on April 13, 2015 by admin.